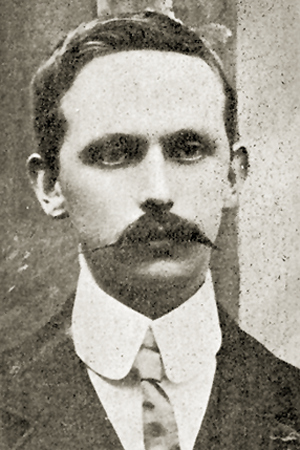 Éamonn Ceannt is a little-known leader of the 1916 Easter Rising. Born in Ballymoe in County Galway, he was one of nine children. His father was an RIC Officer stationed in Ballymoe, and the family were transferred around the country with his father, moving to County Louth, to Drogheada, then to Drumconda in Dublin. He attended the North Richmond Street Christian Brothers School where he was always a keen, intelligent, and interested student. He excelled in his exams. This is where he met two other like-minded people such as Séan Huston and Con Colbert. All three would go on to become leaders in the 1916 Easter Rising. Following his exams, he was offered a position in the Civil Service. He turned this position down because he felt he would be working for the British Government. Instead, he went on to become an accountant with the Dublin Corporation. They Ceannt family were a religious Roman Catholic family. It has been said that Ceannts' religious teaching remained with him for the rest of his life. Always interested in nationalism and politics, he took part in any event that was of interest to national unity. In 1899, he joined the central branch of Gaelic League. It was here that he met the men who would play a central role in the 1916 Easter Rising. As time went by, he became increasingly involved in the Nationalism movements which led to a very strong interests in his heritage and the Gáelic language. The main purpose of the Gáelic League was to educate the Irish people about their heritage. This is turn led him to believe that Irish people deserved to learn about their own language and culture along with music, dance, poetry, literature, and Irish history. Ceannt had a strong interest in his heritage and the Irish language. The main purposes of the league were to educate people on the Irish culture. This involved reviving the Irish language, Irish music, dancing, poetry, literature, and history. Ceannt was an extremely committed member of the league. He was an elected a member of the governing body, and by 1905 he was teaching Irish language classes in branch offices of the League. Along with Edward Martyn, Cennt founded Cumann bPiobain (The Pipers Club) in 1900. His musical talents earned him respect around the globe, and was even asked to put on a performance for Pope Pius X. His musical talents did, in fact, win him a gold medal at the 1906 Oireachtas for Irish dance. Accolades abounded, and he is said to have been instrumental in the Gaelic language being the only language spoken in Cumman na bPiobain. This, in turn, helped to revive the Irish Music scene. He met his wife, Frances Mary O’Brennan, through the Gáelic League; they married in 1905. Their son, Ronan, was born in 1906. In 1907, becoming increasingly determined to see an Independent Ireland, he joined the Dublin branch of Sinn Fein. By 1912, he was sworn into the Irish Republican Brotherhood by Séan MacDiarmada. Ceannt knew that this movement was pledged to achieving Irish Independence by whatever means, even using physical force if it became necessary. As a senior figure of the 1916 Easter Rising, the Irish Republican Brotherhood Military Council met in May 1915 to begin plans for a rebellion. Ceannt was made a Commandant of the 4th Battalion of the Volunteers. During the Rising, he was stationed at the South Dublin Union with more than one hundred men under his command. His second and third in command were Cathal Brugha and W.T. Cosgrove, who went on to become the President Of the Executive Council (Prime Minister) of the Irish Free State from 1922 to 1932. As a Commandant and a powerful Leader, he held a position so strong that under his command they drove back repeated assaults from the determined British Regiments. A contingent he placed at Marrowbone Lane were in a position of strength, and the passing British soldiers were mowed down by an enfilade of artillery. The continued, grinding attacks broke through the Women’s Infirmary leaving Ceannt’s troops vulnerable to attack. Continued attacks by the British soldiers failed to press home the advantage that they had at this point, despite the fact that Ceannt had twenty-times fewer men. His troops were skilfully deployed as far away as Rialto Bridge, which was west of the City. The British troops had to filter into buildings to escape the onslaught from Ceannt’s troops. Although his troop numbers diminished due to casualties and fatalities, he continued his intense fighting following the Easter Rising on Easter Monday for a week. He did, however, have to surrender his position when ordered to do so by his superior officer, Patrick (Padraig) Pearse. After the unconditional surrender by the Irish Brotherhood Military Council (Patrick Pearse surrendered first in order to save the lives of his men), plain clothes detectives known as the "G-men" identified the leaders of the Rising on the first of May in 1916 -- Ceannt being one of them. Always a man who cared about his officers, he tried his best to protect them against British Court Martial. General Maxwell (who served in the Mahdist War, Sudan, the Boer War, and the 1st World War) was determined to afflict the death penalty on all the leaders of the Easter Rising; but he was prevented from doing so by legal issues. He is best known for his execution of the leaders of the 1916 Easter Rising. These legal issues only allowed the death penalty if one was found aiding the enemy, which happened to be Germany at that time. However, General Maxwell pursued his objective of the death penalty vigorously. When he was handed letters written by Patrick Pearse to his mother, he had found his loophole at last. These letters showed that Patrick Pearse had communicated with the Germans. From that moment, Ceannt and his comrades had to accept that they would face the firing squad. “I leave for the guidance of other Irish Revolutionaries who may tread the path which I have trod, this advice, never to treat with the enemy, never to surrender at his mercy, but to fight a finish. Ireland has shown she is a nation. This generation can claim to have raised sons as brave as any that went before. And in the years to come Ireland will honor those who risked all for her honor at Easter 1916." Ceannt was held in Kilmainham Gaol until his execution by firing squad on 8 May, 1916, aged 34. For anyone who has ever travelled into or out of Galway City via bus or train, you went through Ceannt Station (pictured below). I never knew anything about the man for whom it was named until I read this article. Thanks, Mary! Thanks For commenting Ryan ; I am trying to do a blog on all the Leaders of the 1916 Easter Risings it is the Centenary next year. Have another one completed ; just waiting for one of my sons to visit at the weekend - to put the photo in for me . Cannot for the life in me ; cut and past a picture into anything Technique phobic.!! Excellent article. I look forward to reading about the others in this series. Many appreciative thanks. Hello Marie Kuby,, Thank you so much for your comment... I have not written anything for the Wild Gees in along time, because I have been very unwell...However , i do hope you find the rest of my series of articles on the !916 Easter Rising and related subject -- up to standard.. I also have a book out called 'That's Just how it was' it is on Amazon .. Mary Thorpe ..
Hello Mary Thorpe, I really love the fact that your series of articles go into so much detail and that they have accompanying photographs. I've always wanted to know more about the leaders of the 1916 Easter Rising and now, with great thanks to you, I do. I also received through the post today your book "That's Just How It Was", which I can see I'm not going to be able to put down until I've finished it. I'm sorry to hear you have been very unwell, so I hope you are starting to feel a bit better, and that the good days are starting to outnumber the bad ones. Many appreciative thanks again for putting all your Irish memories down onto paper about your grandmother Bridget's life whilst at the same time noting down the corresponding important historical facts together with important Irish figures from that same time period. A history which also includes the Great Hunger in Ireland and the devastation that followed caused by not only the potato blight but also by others neglect; those who could have helped but didn't. It's a real eye opener in that regard. It's been a nice sunny day here, so I hope it's been sunny where you are. Mary, very sorry to hear you have not been well. Please know that that everyone here at TWG and all the members hope you have a full recovery very soon. Glad that you are enjoying the series on Wild Geese ... Much appriciated ..
Hello Mary, If I was a self published author I would not worry at all about not getting onto Waterstones shelves, as instead I would focus my energy on those book selling outlets that will accept my book, which naturally would also include online kindle form. "That’s the joy of independent bookshops. Their personalities shape those of the people who visit them. They’re not homogenous. Their stock tends to reflect their passions rather than the year's best-performing unit-shifters."